Sigmas of Texas, it’s that time again! Houston is our state’s largest city, the 4th largest in the nation, with nicknames like The Energy Capital of the World, Space City, and H-Town. 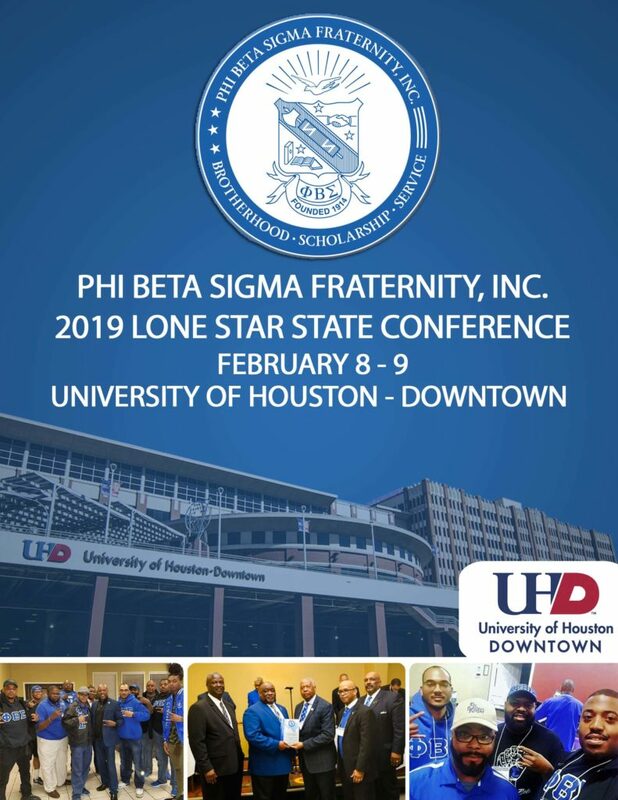 And now it will have one more moniker – host city for the 2019 Lone Star State Conference of Phi Beta Sigma Fraternity, Inc! The Houston metropolitan area is home to five alumni chapters and three collegiate chapters, so the presence of our Culture for Service is strong. Please note the following updates. The location has changed to The University of Houston – Downtown, adding Xi Kappa chapter as a host. The dates will be February 8 – 9 and along with Xi Kappa, Alpha Beta Sigma chapter remains as the alumni host. Each paid conference registration includes skill building workshops, a luncheon, and the registrant can qualify for the Early Bird Registration Gift (must register before 12/17/2018 to receive the gift)! The 2019 Lone Star State Conference of Phi Beta Sigma Fraternity, Inc. will be here before you know it! Don’t miss your chance to register, do it online now! Click here to register! The 2019 Lone Star State Conference Registration packet is available for download! It contains hotel information, early bird information, conference agenda, and other great information, as well as a conference registration form that can be completed and mailed as an alternative option to the online registration method. The registration packet can be downloaded HERE. The 2017 Texas State Conference of Phi Beta Sigma Fraternity, Inc. will be here before you know it! Don’t miss your chance to register, do it online now! Click here to register! The 2017 Texas State Conference Registration packet is now available! It contains hotel information, early bird information, conference agenda, and other information, as well as a conference registration form that can be completed and mailed as an option to the online registration method. The registration packet can be downloaded HERE. There Is Something SPECIAL Going on In PHI BETA SIGMA! The 2016 Texas State Conference of Phi Beta Sigma Fraternity, Inc. is almost here! Don’t miss your chance to register, do it online now! Click here to register! Official Lone Star State FB Page – Phi Beta Sigma Fraternity, Inc.